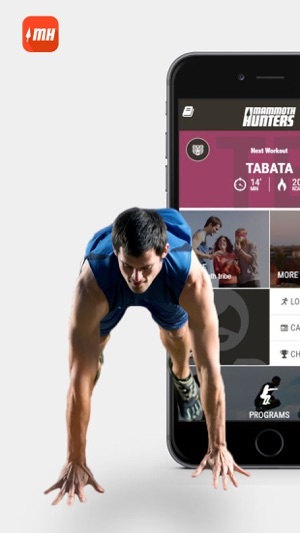 Mammoth Hunters is a comprehensive bodyweight training program. It makes life easy with functional training workouts adapted to your needs. It’s time to change your habits and become a better version of yourself! Shatter all barriers between you and a healthy lifestyle. Get more energy, better sleep, and a training plan that sticks. Start the 14-day FREE TRIAL when you sign-up for the annual plan. ◆ Video-guided sessions ensure proper technique and help you achieve your goals. ◆ Set your training days to fit your schedule. Workout anywhere, anytime. No gyms. ◆ Scientifically backed HIIT exercises, adapted to your level, work all your muscle groups. ◆ Amplify your training. Switch on exercises with weights and/or a pull-up bar. ◆ Get unlimited variety. No two training days are the same. Get results and keep progressing. 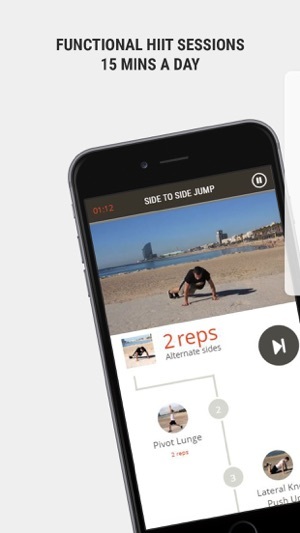 ◆ Earn points with each completed session to unlock exclusive fitness challenges. 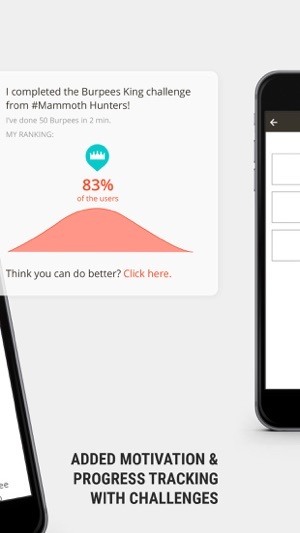 ◆ Track your performance to improve your time and complete more repetitions. ◆ See where you rank out of the other 500.000 Mammoth Hunters users. ◆ See progress against your goals. Share your results on social media. Inspire others. 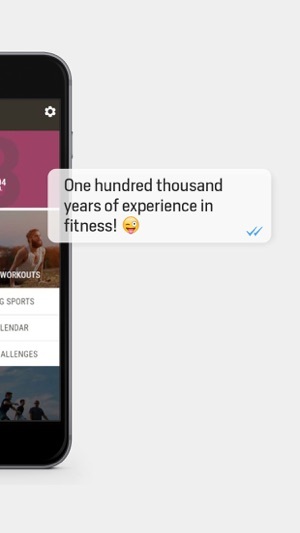 ◆ Fitness challenges focus on improving balance, stability, endurance, and strength. ◆ Workout in Tribes, our training groups. Be accountable to friends, family, the community. ◆ Achieve more together. Poke, like, and chat. Help each other stay motivated. ◆ Compete against your Tribe to become the leader. Fight to maintain your place at the top. Mammoth Hunters workouts simulate the life of the hunter-gatherer. Exercises target several muscle groups at once and are based on High Intensity Interval Training (HIIT). In a short time, you’ll increase metabolism and maximize the benefits of your workout. For PRO users, workout are calibrated to you fitness level. Sessions also include alternative exercises to increase or decrease the intensity. Upgrade to the PRO version the most complete, personalized program. ◆ Unlimited unique workouts with more than 230 exercises and 15 sessions types. ◆ 10 unique challenges to complete and repeat. See improvement over time. ◆ Fitness assessment tests for calibration and to track success. ◆ First access to and discounts on all new training programs. Get the 3 monthly ($24.99) or annual ($59.99) subscription. With the annual subscription you can take advantage of the 14-day free trial. Subscriptions automatically renew. You can turn off the auto-renewal at any time up until 24-hours before the end of the period. If you cancel, access to the Pro features will expire at the end of the current payment period. Integrated fitness programs from experts to provide everyone the perfect program. ◆ “MH PRO” is for all fitness levels, from beginners to advanced athletes. ◆ “Unbreakable” is a 10-week program for advanced athletes. Improve resistance, strength, and mobility. ◆ “Ringmaster” is a 10-week guide to dominate the rings. Improve strength and musculature. ◆ “Train with Jonathan Rea” has 91 session to maximize agility, resistance, and mental fortitude. ◆ “In Shape Moms” is for mental and physically preparation for giving birth, and speeds postpartum recovery. Our team is comprised of trainers, evolutionary medicine experts, therapists, nutritionists, designers, and developers, united by one goal - HELP YOU FOLLOW A HEALTHY LIFESTYLE. Thanks for using Mammoth Hunters! To make our app better for you, we bring updates to the App Store regularly. Every update of Mammoth Hunters app includes improvements for speed and reliability. We hunted down some bugs while doing burpees. I can't say enough about this company. Not only is the program great if you want to get exercising but don't have the equipment, but the customer service is absolutely fantastic. You feel like you're actually talking to people who genuinely care about you. Encompassing not just your health and fitness, but your whole life. I didn't like their meal options, but they do give you a list of how many oz. of meat, carbs, and the like that you need to eat for each meal. That way you can create your own meals based on that. Plus the tribe idea is on point! I know for me, I'll need some accountability if I'm going to actually work out 5 times a week. Excellent training program, excellent nutrition plan, excellent customer service! 5 Stars from me! Would be great if it wasn't so buggy! I love the workouts. It's great that I don't need equipment, and the APP allows for exercises to be changed or modified. But what is disappointing is the fact that almost every workout session freezes with one second left. If you're like me, and you want to keep track of your progress, then this will never be the case when the APP freezes. You'll never get credit for the workout. I've contacted customer service, and they're nice enough and all, and they saw it will be fixed, but it hasn't been fixed. Great program, otherwise. But it'll be the reason I won't renew my Pro Subscription. I haven't used the Nutrition portion of the program, so, I cannot comment on that. This app is set apart from the rest. You get pretty awesome value for the price. 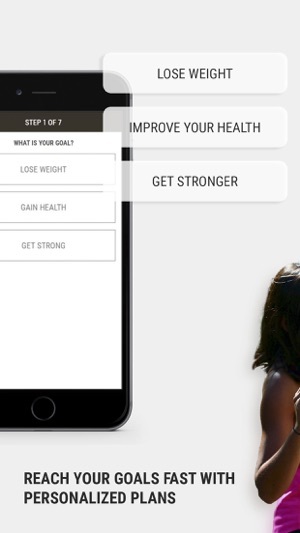 It's a personalized workout system that allows you to track you progress and see your obvious improvement. © 2018 Mammoth Hunters, S.L.